Reverse Osmosis water purification system supplies up to 1,000 gallons per day (just under one gallon per minute) of highly purified water from virtually any water source including seawater! It can be powered by any form of single phase AC or, because of the highly efficient Aspen energy recovery pumping system, can operate from 24 volt DC power directly from a military vehicle’s battery or even a small solar array. 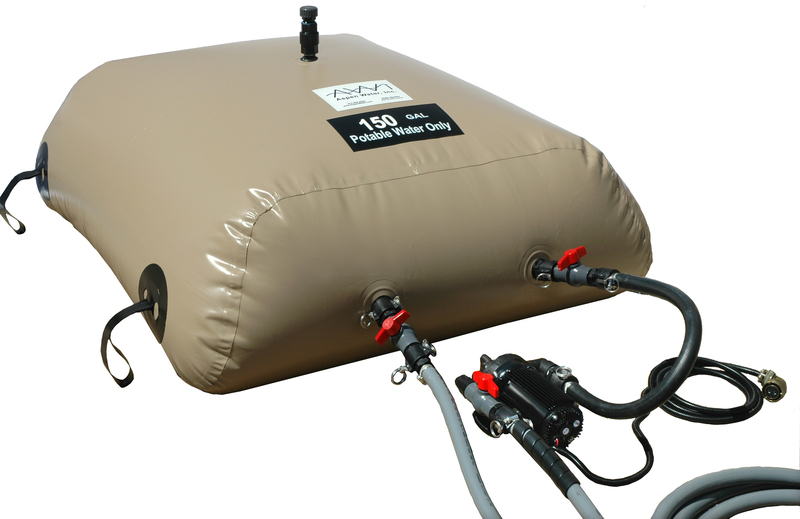 The ASPEN 1000DM is a lightweight highly mobile completely self contained water purification system with war fighter ready technology making it the easiest to deploy, maintain, and monitor of any Military Reverse Osmosis purification system in existence. The Aspen 1000DM is not only energy efficient, but includes a redundant purification system (Reverse Osmosis and Ultra Violet Sterilization) providing the safest drinking water possible in all conditions. The ASPEN 1000DM is 5 times more energy efficient than a conventional AC system and provides wire to water at 15 watts per gallon. Utilizing the Aspen energy recovery system, the 1000DM operates on less than half of the energy requirement for a hair dryer, or less than 650 watts. Total usage is 1.5 KW per 1000 gallons, rivaling large commercial units on efficiency and never before available in such a small system. The unit operates from single phase in 90 to 240 volts AC in either 50/60 hertz or from a 24/28 volt DC source (US/NATO vehicles) and will automatically recognize the varying power sources. The ASPEN 1000DM is operated by the most sophisticated automatic controller and electronic monitoring module available today, providing trouble free service no matter how demanding the environment. While other systems use gauges and require constant monitoring with repeated reference to an operating manual, a quick scroll through the Aspen digital display provides the operator with the exact status of the system at all times. The ASPEN 1000DM IS SIMPLE TO OPERATE.The combination of its high tech controller and Aspens unique energy recovery system eliminates the need for high-pressure adjustment in the field when using water at different levels of salinity. The Aspen 1000DM constantly monitors product salinity and filter condition when in use and will audibly and visually indicate if service is needed. Automatic monitoring and safety shut down protocols allow for unsupervised operation. The ASPEN 1000DM IS WHISPER QUIET,as much as 5 times quieter than conventional systems. The Aspen energy recovery system eliminates the need for noisy inefficient high pressure pumps. The ASPEN 1000DM IS RUGGIDIZED.The electronic controls are housed in a completely sealed, thermally controlled, and shock mounted enclosure made from the highest grade stainless steel and high tech non- corrosive lightweight aircraft alloys. These materials are used throughout the system. Strict design requirements and assembly procedures allow it to withstand the rigors of military use and harsh environmental exposure. The membranes are wound to meet higher than industry standards and provide extended use with less degradation and failure. The lightweight self-contained unit is 32”L X 27.25”H X 27”W with a dry weight of less than 220 pounds. 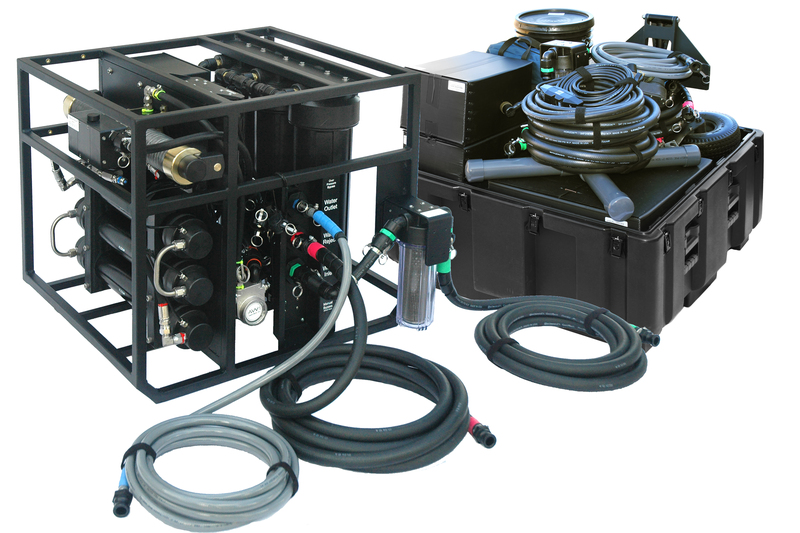 The Aspen 1000DM comes with a Support Case containing hoses, consumables, and spares, which easily fit into a small vehicle.